Shirtsleeve weather here yesterday. This morning two robins were mating in mid air with a third looking on hopefully. The daffodils are poking through newly thawed ground out by the steps. We usually get a February thaw. Looks like it is getting started now. 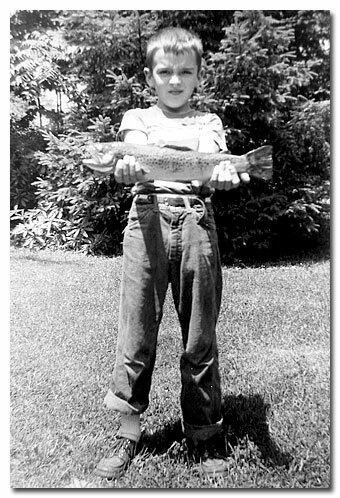 When I was a kid Bill would take me along to North Fork Dam to fish an inlet stream for suckers. We would stand along the concrete railing and toss a big bunch of worms on a heavy hook with a one ounce sinker a foot above. The winds of early spring would drive off the lake and up the little stream turning our cheeks bright red and making our knees chatter. Once in a while a sucker would hit and we would haul it up to the bridge railing, work the hook out, admire it a bit, and let it drop back in the water. I remember the sad eyes, great big ones, that seem to plead with you. I don't think I ever caught any of them, but Bill did. He was a meat fisher, still is, though he seldom kept any fish to bring home to cook. Mother wouldn't cook suckers anyway. I was about seven or eight at the time. 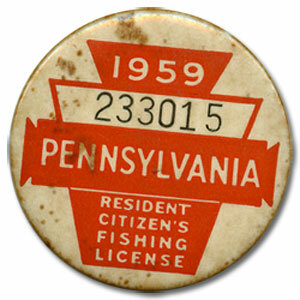 Hopes for trout season started early in Pennsylvania then. 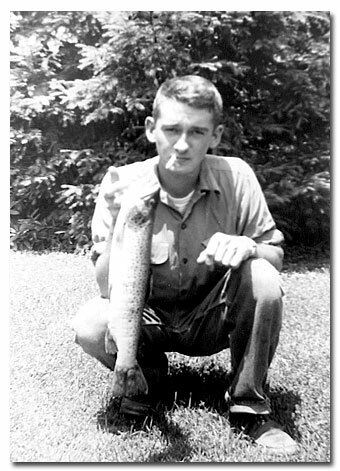 No waters were open for catch and release fishing back in the 40's and 50's. Everything was off limits. Suckers were the only fare. The little tributary stream at the concrete bridge had only suckers as far as we knew. But one Saturday morning just before the cold winds started and chased us home, Bill got a hit to the worm rig that was much more than any sucker we had ever seen. I can still see the bend in that old steel casting rod and the black line shooting off the Ocean City reel as the big fellow headed down that little stream to the lake. You couldn't run after him because the property was owned by the Water Company and was very heavily posted and patrolled by security guards. All you could do was watch that line disappear in the dark waters of early spring and wonder just what it was that made last weeks suckers seem so insignificant. Folks had talked about big rainbows in the lake, but we had never seen any. Bill is pretty low key, but I can remember seeing the strain on his face and the flush of excitement getting a grip on his chattering knees. He was furiously trying to get things under control as the little double handles of that reel were banging his knuckles. The level winder was shooting back and forth at a furious pace and the dark little barrel of line was getting smaller and smaller. Finally things began to slow and the rod began to straighten, stop! A big sag in the line, gone! "What the hell was that?" Bill said. I just stood there with my mouth open. I doubt that I said anything. It was one of those things that cling to you in the middle of the night, but when you wake up with a start you can't quite put it all together. Bill slowly wound the line back in. It seemed to take forever. Finally the big sinker came up and the short snell and the big bare hook. "That sure wasn't a sucker." Bill said. Funny how your perspective changes. We often went back to the concrete bridge to fish, but from that moment on it was always to the expectation of a big rainbow. We never saw any and never really heard of any but hopefulness was always there. I guess that is why we fish, after all. I've often thought back to that cold morning and wondered about that big fish. I've often wondered if the memory would have been as intense if Bill had landed him and seen him and touched a fish that never existed. I think we live best in our thoughts. Our realities are too often anticlimactic. The first warmth of Spring is drifting north to warm the waters and bring the suckers back for another year. Bill and I won't fish to them this year. We haven't fished to them since I was a kid. Bill will fish the special regulation areas till the season opens. I'll fish Mossy a little. The expectation of opening day won't be with us this year as it used to be. We can fish any time we want to anymore. Maybe the old days of expectations and anticipations were the best, but then maybe it was just the enthusiasms of youth that were best. Hard to get a handle on how things change. Bill is in his seventies now. Nobody in our family has ever lived much past seventy. I wonder how many more early springs Bill and I will be able to live the memories of that elusive fish at the concrete bridge.